Jaclyn Hill Champagne Pop Face Palette, £48 + Jaclyn Hill Champagne Pop Eye Palette, £36 = £84 - It's the launch that's been the talk of the town and it's finally arrived at our very own UK Space NK after completely selling out on Sephora for the time being. Jaclyn has once again teamed up with Becca to produce the dreamiest, sheen-iest, five-pan face palette featuring the original, iconic Champagne Pop, along with another gold toned highlight, two mineral blush shades and a luminous pink pop of cheek colour. Not only that, but alongside it she's also brought out a limited edition eye palette containing five warm, neutral, shimmer and matte hues which together, enhance and define for the prettiest smoky eye. Diptyque Philosykos Eau de Toilette, £60 - My go to summer scent above all else with light, green notes, I get wafts of both fresh grass combined with a blend of coconut it - aims to capture the essence of a sunny, Green island which lingers all day long. It's a unisex fragrance and is loved by both males and females, though I'm not sure if I'd fancy it on my fella so for me it's more of a girly number. And yes, Diptyque are cruelty free if you missed the update *throws party*. By Terry Sheer Expert Foundation, £45 + Beauty Blender, £16 = £61 - Just recently I've been going back to this base and I'll go as far as saying it's up there in my top five - dewy, natural, yet incredible coverage and suits all skin types as a self-adjusting formula which targets excess oil, helps hydrate and completely covers lines, wrinkles and blemishes. Another re-discovery is this spongy tool, which seriously gives a flawless finish like no other when it comes to foundation application, blending everything in a dream - the results? They're just ah-mazing, you've got to try it for yourself. 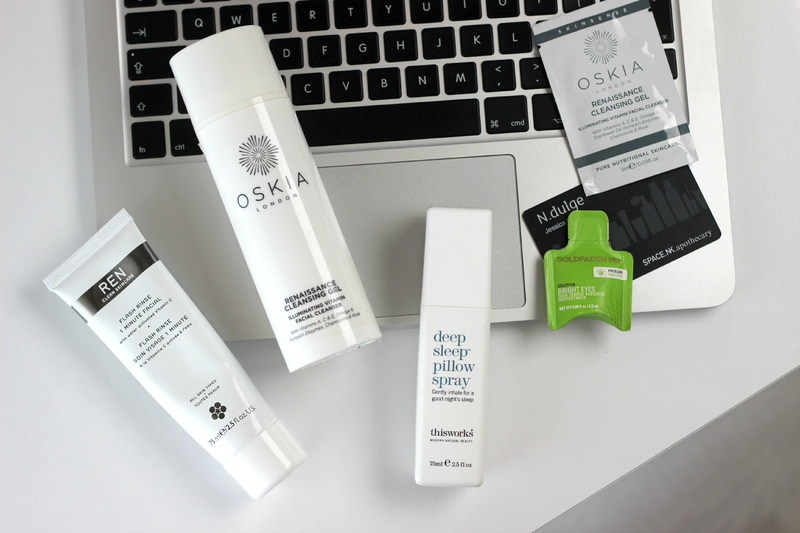 Oskia Renaissance Cleansing Gel, £28 + REN Flash Rinse Facial, £32 = £60 - On the lookout for a new cleanser? Glance this way. This gel-turned-balm steps in for my morning routine, but I'll often reach for it over any of my others come evening too. It melts into the skin just lovely and leaves it feeling plump, nourished and looking radiant, then followed with this treatment by REN once weekly further smoothes things over allowing follow-up serums, oils and creams to soak in all the better. It's only slightly scrubby, so I buff away with it for around a minute and wash it off with a hot cloth - it's by far a fave skincare staple. With a few combos and contents to throw in your basket, I'm hoping the above will help knock off that £15 discount if you needed a bit of a push before it expires on Thursday 9th June - and what's more, with all orders, they'll throw in 3 complimentary samples of which you can take your pick from. Score.